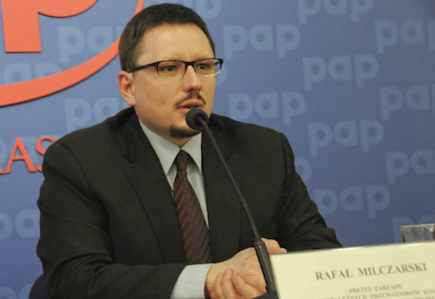 Rafał Milczarski at a recent ZNPK press conference. Photo ZZKSL. Rafał Milczarski and Emil Dembiński, the Chairman and Vice Chairman respectively, of Freightliner PL announced yesterday that they are leaving the company in order to enter politics. Milczarski and Dembinśki were the founders of Freightliner PL, having previously worked together in Kolej Bałtycka SA. After attending VI L.O. im. Jana Kochanowskiego in Radom, Milczarski won a scholarship to Downside School in England and then went on to study at Cambridge University. Milczarski returned to his home country ‘because he wanted to be involved in building a better Poland’ after the collapse of communism in 1989. Milczarski was heavily involved in campaigning for a better deal for Poland’s railways, and for fairer treatment by PKP and the Polish government for the new generation of railway operators. He was the founder of the Association of Independent Railway Operating Companies (ZNPK) and also one of the people instrumental in setting up the “Pro Kolej” Foundation. Rafał is succeeded in the post of Chairman by Konstantin Skorik, European Business Development Director Freightliner Group, formerly an Operations Officer with the World Bank. The RM’s John Heaton visited the Kujawy-Pomorze province of Poland and interviewed Arriva PL management about the trials and tribulations of operating a private passenger TOC in a country where communist-era customs and practice are still common. His PKP IC train takes 129 minutes to cover the 160 km journey from Gdansk to Bydgoszcz, quite smart work by Polish standards. But John is not impressed. In Bydgoszcz the train is split into two halves – an archaic practice according to John. In Torun John meets Arriva’s local management. There is much talk about the Marshall and his office. Has the sheriff ridden into town? No, John is referring to the Chief Executive of the provincial government. On second thoughts, perhaps John Wayne and his deputies are just what Polish railways need to clean up their act. Arriva suffers from unlicensed mini-bus operators stealing passengers 5 minutes before its trains call at stations. It also faces competition from local passenger service TOC Przewozy Regionalne, which is owned by the provincial governments. John gets to interview Arrival PL chairman, Damian Grabowski, who describes how he would go about the job of improving rail passenger services in Poland. BTWT verdict? A good article – factual and informative. Go out and buy a copy of the RM October edition as soon as you can!